Wiznet W5100 Ethernet Shield for Arduino - Development Boards - Buy in India - DigiBay - Embedded electronics and robotics online store. 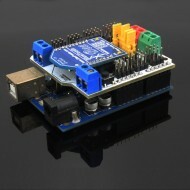 The Arduino Ethernet Shield allows an Arduino board to connect to the internet. It is based on the Wiznet W5100 ethernet chip providing a network (IP) stack capable of both TCP and UDP. The Arduino Ethernet Shield supports up to four simultaneous socket connections. Use the Ethernet library to write sketches which connect to the internet via a standard RJ45 Ethernet jack using the shield. The latest revision of the shield adds a micro-SD card slot, which can be used to store files for serving over the network. 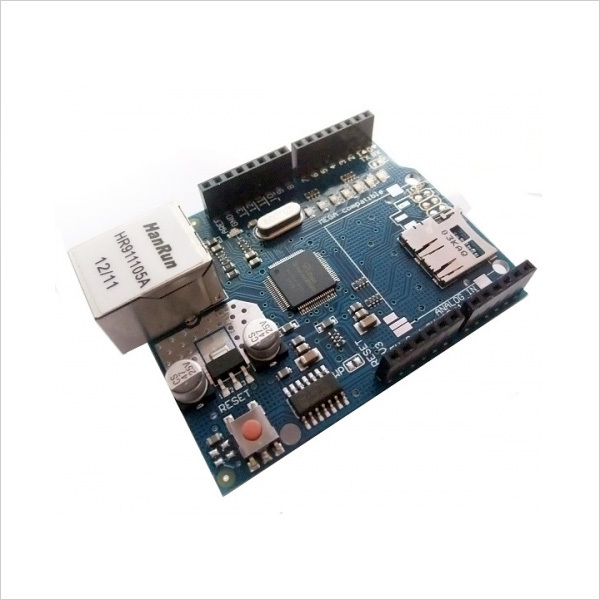 It is compatible with the Arduino Uno and Mega (using the Ethernet library). You can access the on-board SD card slot using the SD library which is included in the current Arduino build. The latest revision of the shield also includes a reset controller, to ensure that the W5100 Ethernet module is properly reset on power-up. Previous revisions of the shield were not compatible with the Mega and need to be manually reset after power-up. The reset button on the shield resets both the W5100 and the Arduino board. Note: As of February, 2012, we are shipping the R3 version of this board. The only difference is the appearance of extra pins so that it's compatible with the Arduino Uno R3 shield design. The functionality is the same and you can still use it with your pre-R3 Arduino but you may want to trim back or de-solder the extra headers.